Just a few of our articulate, brave and inspirational speakers at UrbanPromise. Well done! PENNSAUKEN — A teenager who came to America knowing just a few words in English was among the winners Monday in a speech contest devoted to historic figures who've overcome adversity. "This represents success," said a smiling Jason Do, 15, after being honored for remarks that urged his listeners to believe in themselves at all times. The East Camden youth, who arrived from Vietnam at age 5, was among participants in a Martin Luther King Jr. speech contest hosted by UrbanPromise, a ministry that works with city youth. In his address, Do drew parallels between the accomplishments of Jesse Owens, the American star of the 1936 Olympics, and the efforts of himself and others to surmount steep challenges. "Raise your hand if you've ever felt the odds were stacked against you," asked Do, drawing a response from dozens of listeners in the largely youthful audience of about 100 people. Speakers at the 16th annual event discussed athletes and actors, poets and presidents. They cited pioneers in the efforts to end slavery and segregation, and they also urged audience members to support the struggle for a better society. Some participants had to overcome their own challenge -- stage fright. "I was so scared that I made excuses not to be here," said Joshua Rodriguez, 14, an eighth-grader at East Camden Middle School. "But what if Malcolm X got afraid and it held him back? Hopefully, like Malcolm X, I can overcome my fears." "I felt so scared at first," allowed Giona Hance, 9, of Waterfront South. "But once I started reading my speech, I was happy." Giona, a fourth-grader at Wiggins Elementary School, urged listeners to "show love to people by giving them what they need, like pencils and toys. If we meet hate with love, the world will be a kinder place." "This is her first speech," said Giona's father, Darnell, as he sat in the audience at the Pennsauken headquarters of UrbanPromise. "It won't be her last," predicted the girl's mother, Mickey. The students developed their speeches over several weeks with help from UrbanPromise personnel. "This prepares them to become a responsible researcher and it also teaches lessons about the people who have gone before them," said Promise Mchenga, an UrbanPromise intern from the African nation of Malawi. He assisted Bryan Estevez, a 9-year-old winner from the city's Davis Elementary School who talked about the poet Langston Hughes. "He inspired me to write my own poetry," said the fourth-grader, who recited Hughes' verse as part of his presentation. "He made me happy and proud." Christopher Williams, a 16-year-old senior at UrbanPromise Academy, also cited the impact of language in his talk. "Words have power," he said. "You cannot control where your life takes you. But take pride in knowing that your very goals and your hunger for them to see daylight will add direction to your journey." And Do, a sophomore at Camden County Technical Institute in Pennsauken, urged his listeners to act on what they had heard. The Whites and Blacks did not get along but Martin Luther King Jr. made a difference. The Whites did not let the Blacks go to the same school. They had signs that said "Whites only." Martin Luther King Jr. made speeches, led marches and other peaceful protests. He said, "We must meet hate with love." This is what I think about hate and love. For example, Angel is a boy in my school who is really rude. He tells people to "Move!" He teases people, calls people names and picks on their mom and dad. Angel shows hate. My friend Genesis shows love. Genesis shows love by giving pencils to people, helping his friends in math and being funny. He makes me have joy and hope. If you do good things to people that have hate it will turn good. You can show love to people by giving themthings they need, like pencils or toy. If we meet hate with love the world will be a kinder place. Martin Luther King Jr. died on April 4, 1968, but the difference he made is still living. There is still a lot of hate in this world by soon it will change. Just last month Camden City was again disparaged by headlines in the national papers. "HALF OF POLICE FORCE LAID OFF!" National news commentators reveled in the irony of America’s most dangerous city losing—not gaining—police on the streets. We support great policing. And, happily there are many dedicated police officers in Camden who work hard to protect our law abiding citizens - including a former UrbanPromise StreetLeader, who patrols our neighborhood! Yet, I find it interesting in all the debates and media attention, no one really talks about alternative ways to address the problem of crime—especially with youth. As a society we seem to think that incarcerating and policing our way out of the problem, rather than doing the hard work of investing in the development of our young people, is the way forward.People are outraged by the reduction in the police force, but they show little passion about making investments in prevention of crime. Even local church doors remain closed to neighborhood kids Monday through Saturday. Many of our states have created huge deficits, spending money on the building of more prisons as they try to build and fence our way out of the issue of crime. ministries which invest in young people, create safe places and support our youth before they get into trouble with the police? What creates safer and more peaceful neighborhoods? Police certainly play a role but we at UrbanPromise know from our 23 years of experience that the 500 children and teens in our programs have the potential to significantly reduce crime and minimize the need for police. The kids in our program often police themselves while calling their friends and family to higher standards of behavior and conduct. The choice is obvious. And significantly less expensive. And that is what UrbanPromise does 365 days a year. We do the hard work of investing in young people, helping them develop into visionary Christian leaders, leaders who are changing their neighborhoods by being positive role models. I spent an afternoon at the Camden Court House a few weeks ago. A group of UrbanPromise staff were supporting a 16 year old who had gotten in trouble with the law. The young man had a rap sheet that started at age 9, but with our help was now taking strides to turn his life around. As I looked around the court room, I made a mental calculation of the cost for the tax payer for this one hour hearing: a judge, two court reporters, a public prosecutor, a defense lawyer, a woman who monitors electric ankle bracelets, a social worker, a psychologist and several security guards—all salaried and with benefits. Our 16 year old friend had no idea his afternoon in court cost us tax payers thousands of dollars. And every time any young boy returns to the courthouse, or goes to jail, our costs continue to escalate. helping to redirect other children. In a time of severe budget cuts and reduced policing, more than ever we need to keep our programs, events and activities consistent and growing—creating safe, peaceful places for our children to come after school, in the evenings and on weekends. Please consider making a PLEDGE of Safety to our young people by underwriting a day of quality programming at UrbanPromise for just $26. Or consider underwriting two days for $52, a week for $186 or two weeks for $364. P.S. CLICK HERE TO MAKE A DONATION! UrbanTrekkers love the journey; whether trekking through a foot of snow while participating in our January Outdoor Leadership training with zip lines and vertical towers or kayaking on the Assateague Bay alongside wild ponies. This past Saturday was no exception as we loaded up the Trekker Bus and headed up the turnpike to New York City for an urban adventure. There were thirty of us, students and mentors, Trekkers all, as we boarded the Staten Island Ferry. The free ferry over to Manhattan has to be one of the best travel deals going anywhere. 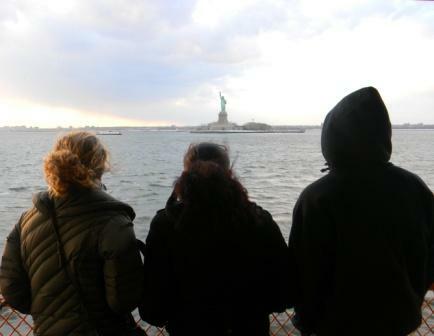 In spite of the cold, biting wind, the students stood out on the bow deck to view the Statue of Liberty and the amazing New York City sky line. This urban adventure was full of first-time experiences for many of our new and younger students; first time to New York, first time on the ferry and first time riding the subways. It was also the first time I led thirty Trekkers through the canyons and caverns of the “Big Apple” - yikes! I’ve canoed with students alongside Alligators in the Everglades and set up camps next to fresh bear tracks on the Appalachian Trail, all of which pales compared to herding 30 people through the ferry and subways of New York. Whether hiking a wilderness trail or trekking across 42nd Street, teamwork and leadership skills are a must. Maps and routes, itineraries, clothing check list as well as finding an affordable place to eat in Manhattan all contribute to a good day out. Designating a point person and “sweeps” that will bring up the rear are further essentials to a safe and enjoyable outing both in the city and in the wild. Students got the chance to ice skate on the outside rink at Bryant Park, eat at a Mexican Restaurant, and hike through Times Square, ride subways and the ferry and spend the day in New York City. All this and we didn’t lose a trekker! God is good. It's getting competitive here at UrbanPromise! Despite the cold and snow this winter, forty 3rd-12th graders have been faithfully meeting with their mentors every week since early January. They have spent numerous hours researching, writing and honing in on their delivery. All in preparation for the 16th Annual Martin Luther King, Jr. Speech Contest this coming Monday evening. This is no ordinary speech contest (if there is one). Participation in this contest becomes a badge of honor for our students. The winner receives a very special gift … bragging rights for the year. Believe me we hear about the contest all year long, especially from the winner. The speech contest has had a history of students creatively expressing their own challenges in life and how they desire to make a change in the world. This year Nyan Trieu is a top contender for the 4th-8th grade category, taking first place in last year’s competition. “I am extremely excited to be apart of the speech contest this year and focus on my delivery. I enjoy speaking about great leaders who have impacted culture,” shares Nyan. Each student participating in the contest is paired with an UrbanPromise staff member, intern or teen mentor who meets with them weekly. Countless hours of encouragement, laughter and practice are invested in our young people. Many are speaking in public for the first time. Help me underwrite the cost of a “team” (child and staff pair) for just $120. Or maybe sponsor a mentoring session for just $20. Or sponsor a few teams! Come Monday a third grader with the shaky voice will stand up in public for the first time to give a speech to a room of 150 supportive peers, parents and staff. Moments like these help to change the course of a child’s life. Please stand with me and help us support our young people. PS. If you are interested in coming out and cheering on our young people as they deliver their speeches please RSVP to Joy Messner at (856) 382-1854 or jmessner@urbanpromiseusa.org. I hope to see you there. On Friday, Feb. 4, the entire student body from UrbanPromise Academy travelled to Philadelphia for a bus tour of the world- renowned Mural Arts Program and their over 3,000 wall murals that beautify the city. Students saw a tremendous variety of themes and styles that artists and communities have collaborated on to bring messages hope, heritage, and healing to the neighborhoods. Beginning this month, UPA students will be soliciting ideas from all members of the UP community on what they would like to see in a mural for our campus. Through a generous grant from The Margaret Hall Foundation, a mural will be created over the spring months on the façade of The Eastside building on 36th Street. Look for more information about how you can become involved in this exciting project that will bring beauty and meaning to our campus. Gary Bernard, author and illustrator, spent an afternoon with CamdenForward School elementary students. All grade classes listened as he read his first published book, Ollie and Tugg. He told students how he takes his sketch book everywhere he goes to capture ideas for his sketches! He spoke about his background as a child and how he came to be a writer and illustrator. He also read, Pemba Sherpa, and presented a slide show of his drawings, which he designed for the book. The students loved asking questions and the interaction they had with Gary Bernard. Everyone enjoyed his presentation about his books! Jackson takes a break from data entry to pose for the camera. 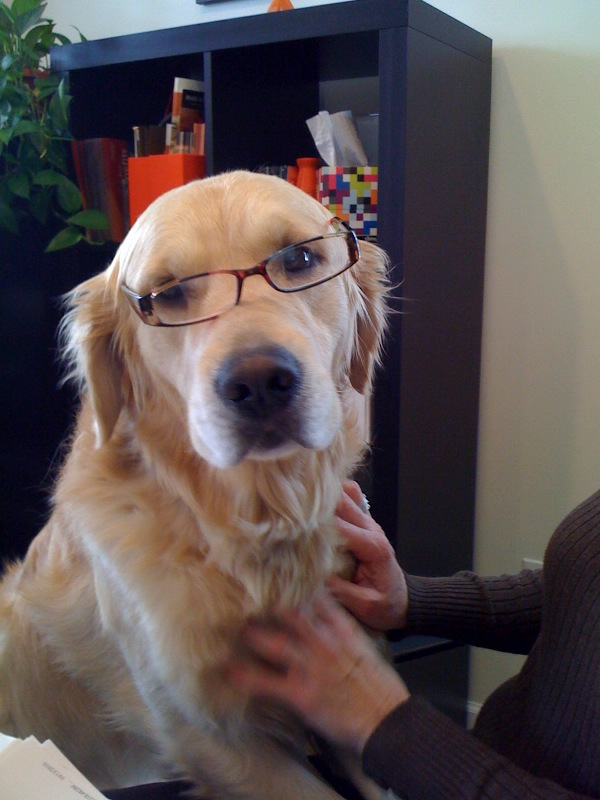 We can't wait for spring break college workgroups to get here! Here's a video from Bowdoin College's workgroup last spring. Looking forward to having you guys back.